It is great pleasure of Gallery VER to invite you to Arin Rungjang’s solo exhibition “Space Gravity Rebound”. The show presents artist’s new installation of interplays between common perceptible facts of life. But those facts are too common to traverse in their antagonistic and close-knitted intertwinement. “Space Gravity Rebound” reassembles and articulates three interwoven facets of all individuals. Additionally, the three aspects derived and entwined directly to Arin’s personal fascinations. The installation is dispersed into three parts. Space invites the audience to ponder their positioned existence and being among others within the lived experienced where space can both embraces and demarcates. “Gravity” summons the audience to recall the prevalent energy that push and pull things apart. “Gravity” also conveys poetic sense of resistance and obedience governed by worldly mandate. Lastly “Rebound” invokes the audience to recall their obsessive perplexity that play upon uncontrollable forces and to avail oneself to experiment with consummation, a reciprocal gesture that alternate between a nexus of decline and recurrence. Arin studies the deconstruction and reinterpretation of the poeticized space. By moving through the narrative-knitted physical space, he captures and reveals its tacit qualities. He highlights the cryptic interrelations of public and private spheres, space and memories, as well as space and its perceptible distance. As a consequence, the audience is propelled to address the narrative-imbibed space; the awkward pause and to be aware of the locus of their perplexities towards the ready-made representation, the unknown, and their ambivalence. 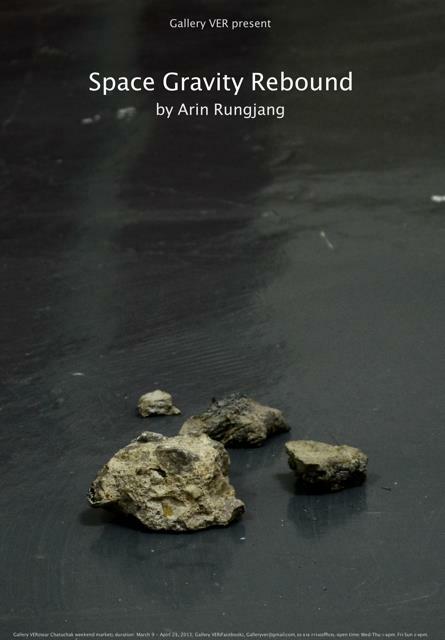 Arin’s recent solo exhibitions include, “Let’s make sense”, together with Kornkrit Jianpinidnan, Chitti Kasemkitvatana, Sivaroj Kongsakul, Shooshie Sulaiman, and Rirkrit Tiravanija, Gallery West, Den Haag Netherlands, 2011; and Russamee Rungjang, Gallery VER, Bangkok Thailand, 2009. Arin has been invited to exhibit his works on various international platforms such as the 18th Biennale of Sydney, Sydney Australia, 2012; Shanghai Biennale, Bandung City Pavilion, Shanghai China, 2012; Singapore Biennale Open House, Singapore, 2011; and Bangkok Density, Gallery Biagiotti, Florence Italy, 2011. He also participates in various artist-in-residency programs, most recently with One Big City, CEC Artslink, New York supported by Rockefeller Foundation, United States of America, 2012; AIR Antwerpen Artist in Residence, Antwerp Belgium, 2012; and IFICAN, Difference Exchange Project, London United Kingdom, 2010. Arin Rungjang (1975, lives and works in Bangkok, TH).